This is a pastel drawing on black Canson paper 19×25″. Here lies one more art medium I haven’t had the pleasure of working in. Of course since I haven’t really worked with it, I’m going to find it somewhat intimidating and if I find it somewhat intimidating then it really should be part of my creativity challenge! It wasn’t too bad actually. I found it moves along faster than other mediums. Most likely because nothing has to dry. 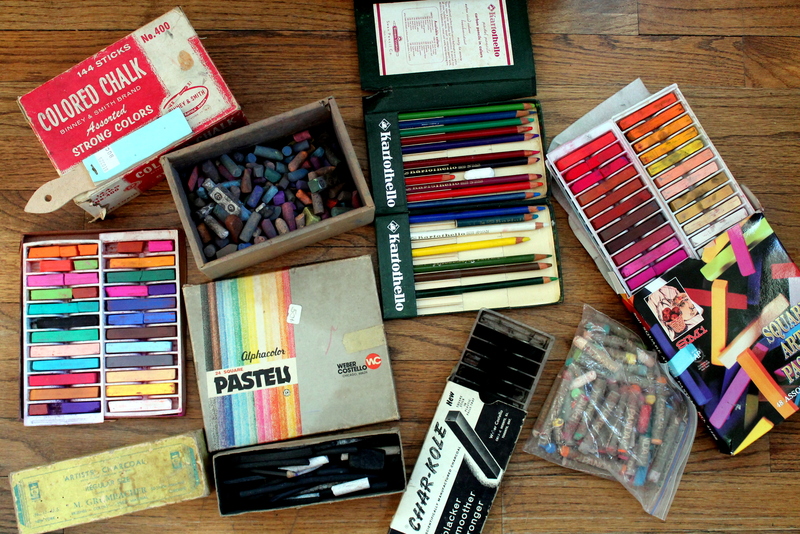 Above is a wonderful treasure trove of artist pastels handed down to me by my illustrator grandfather after he passed away. Some of these materials date back to the 1950’s- 70’s. He’d be happy that they weren’t thrown away and were put to good use. I just love the old boxes. They make me think of his artist studio. My grandfather used quite a bit of charcoal and pastel. He drew illustrations for King Features Syndicate in NYC. Many of them were for magazine articles and stories. The most memorable were murder mysteries. The drawings were great. No one else knew that it was his wife posing dead on the floor or his children shrieking in fear! Every year he would gather all of his grandkids and pose them in all sorts of crazy positions. A few months later these magical Christmas cards would emerge. All of us kids would be pointing toward the North Star, There was Grandpa and his little angels, little drummer boys, he was so creative. I’m lucky to have been born from such a creative and supportive family, really blessed. I began by mapping out the lights and darks of my furry friend. From there I created the patterned Afghan, and then went back and added some finishing touches to Willow. You have to know the blanket’s my favorite part, however I do love to watch my little kitty all snuggled up cat-napping. Willow loves to sit on ALL of my papers, mostly my artwork. If I leave the room for even a minute, when I come back she’s lying on my artwork. Today wasn’t any different. I came in and Willow was sitting on my pastel. 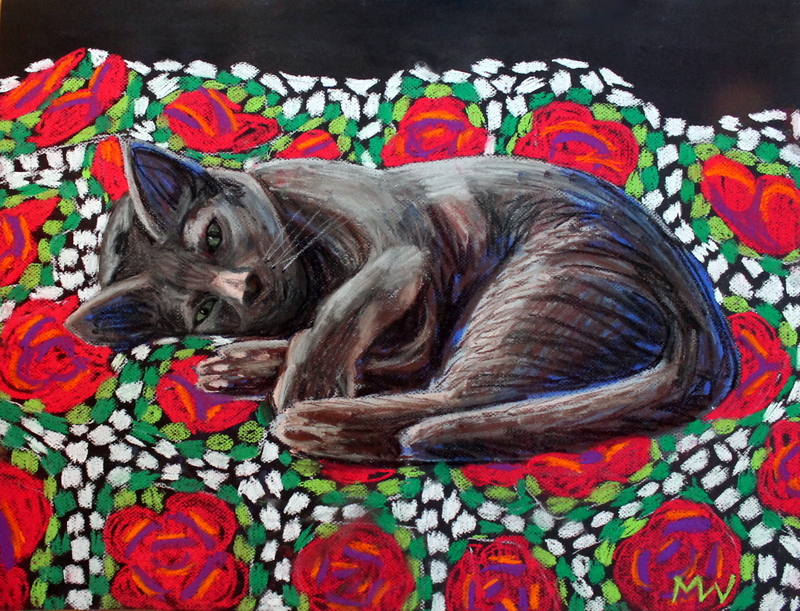 Do you have any idea what damage a cat can do with pastel? I had little blue kitty tracks everywhere! She’s lucky she’s so cute and soft, that’s all I gotta say on that matter. Which brings me to my final thought. 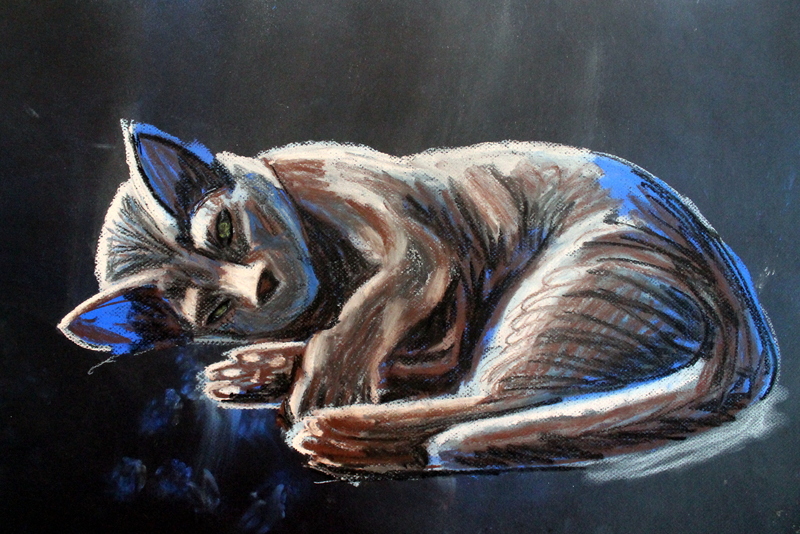 Can anyone out there give me advice on how to work with pastels neatly? I made such a mess! My table was covered, my floor was covered and I was covered in very richly colored pastel dust. When I added water to the table, I added an extra 20 minutes to my clean-up detail. It became a colorful spackle! I brought out the vacuum for the floor and myself, but something tells me I only got half of it. How do pastel artists set up and walk away unscathed? I’d love to work with this medium again, but something tells me I may need to invest in tarps and a Hazmat suit! Wow, I actually finished with an hour to spare today. That hasn’t happened in months. As a special treat, I am off to do a little local Christmas shopping. I hope you all are having a Merry!